Is your heart pounding like crazy when you see your heartthrob? I bet you want to give them a big hug and hot kisses and never let go again. Let’s be honest! Are you really sure that you were made for each other or is it just a little crush? Do you get jealous when the person you love is also much-courted by a lot of other people? Yes... It's really gets on my nerves. Only when he/she starts flirting as well. Is there anything that you can't tolerate in a relationship? When I know that he/she loves me then I can forgive him/her anything. You are at a party. Your dream boy/girl is also at that party. Suddenly he/she is gone and later you find him/her smooching in the bedroom. How do you react? I walk away silently and pretend that I didn't see anything. Imagine it's your birthday. Birthday's are the time to make lots of wishes. What's at the top of your wish list? I wish that I finally meet the person I dream about every night. It's your birthday and it's time to write a list of your resolutions for the next 12 months. Looking back to the last year, do you think it was a good year for love? It was great! I've found the love of my life. There are always ups and downs... the last 12 months were no exception and the next 12 months won't be either. I hope that the next year will be better. You discover that your partner had several one-night-stands before he/she met you. What's your reaction? I'm sceptical and wonder if I'm just another quick affair for him/her. I feel a little bit proud because somebody with him/her level of experience goes out with me. It doesn't matter to me. It's a thing of the past. The only thing that matters is that we are together. How do you think your dream boy/girl will wish you a happy Valentine's Day? He/She probably won't surprise me because he/she doesn't know that I'm in love with him/her. He/She gives me a nice soft kiss and wishes me a happy Valentine's Day. He/She will probably think of a big surprise for me. By chance you notice your secret love in front of a shop working as Santa Claus. What happens next? I approach him/her and ask if it's allowed to kiss Santa Claus. I walk straight past him/her. I would feel uneasy to talking to him/her in this situation. I ask him/her if Santa Claus is available after work. What's your approach to steal your heartthrob's heart? I look at him/her and wait for them to make the first step. I try to get his/her attention by wearing flashy clothes. I start flirting with him/her. How do you impress another person? I don't need to impress anybody. I'm just the way I am and nothing more. I try to get noticed by making funny remarks. I try to be cool. During lunch break, you have a flirt with your heartthrob. Later your colleagues start teasing you. How do you react? I feel embarassed and don't say anything at all. I get really mad at them and think of ways of revenge! You only know your heartthrob from far. Maybe he/she is the right one when it comes to looks. However that's not enough for a lasting relationship. The appearance and nature of the other person are as important the feelings which both partners have. To find out if your partner is really your dream boy/girl you have to get to know him/her better. You have to tell your heartthrob what you feel and what you think. This will help you to get your relationship really started. It's up to you if you turn it into something lasting or if it's just a brief flirt. When you're in love, you always think you've found the greatest love of your life. Your rave about the other person and you are in seventh heaven. But then you are brought back down to earth when you notice that not everything in your relationship is 100 percent ok. You have to learn that it takes time to build and develop a strong relationship and it doesn't happen over night. Feelings are not everything, you should also try to develop a real friendship with your dream boy/girl. You shouldn't be frustrated when things go wrong. You learn from mistakes and will be wiser afterwards - creating a stronger loving relationship. 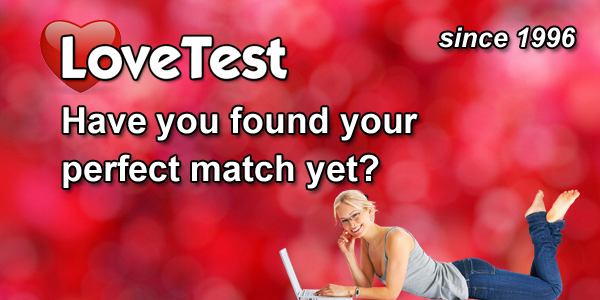 You've found your perfect match! Congratulations! It looks like you've found the perfect partner. You and your dream boy/girl are a perfect match. You've got similar interests and you know how the other person ticks. You know the strength and weakness of your partner and accept it. You are realistic in your relationship and a good fight once in a while is healthy for any relationship. You know that love wins in the end. You don't have to put a show on to impress your dream boy/girl - you can be the person you really are. That's very important for every happy-end.